Accuweigh ’s Newcastle branch recently completed a weighbridge relocation for BMR Quarries based in Tamworth NSW. A second-hand weighbridge deck measuring 20m by 3m was purchased in Sydney by BMR and transported to their quarry for relocation. The weighbridge deck was in good condition but did not include the weighbridge loadcells or a digital weight indicator which were supplied by Accuweigh as part of the quoted price weighbridge relocation. 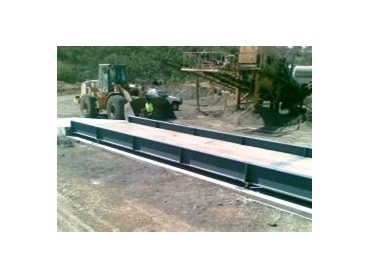 As no civils drawings were available for the previously installed weighbridge deck, Accuweigh’s QWM branch in Brisbane hastily generated the required drawings and forwarded to the client’s civils contractor to ensure the integrity of the weighbridge relocation. Accuweigh also supplied a weighbridge remote display to enable truck drivers to see their axle weights as they drive onto the weighbridge. The weighbridge relocation was completed within two working days after the weighbridge foundations had cured and included full weight testing, calibration and certification for trade use. BMR Quarries is a family owned and operated company, which focuses upon the supply and delivery of crushed rock and other raw materials for use in construction on time and to specification. Accuweigh is Australia’s largest industrial weighing company and has branches in all mainland states with the capability of performing weighbridge relocations, weighbridge testing and weighbridge certifications.